Real Estate and Urban Development in South America uncovers how investors are navigating South American real estate markets in commercial, residential and infrastructure development. A preferred location for real estate development during the colonial era, in recent decades South America has been seen as high-risk for global real estate investors. This book explores the strengths and weaknesses of real estate markets in the region, concluding that with careful implementation of the correct development strategies, the region can once again take its place at the centre stage of global real estate investment. Comparing the economics and market maturity of South American countries in turn, the authors draw out the particular contexts in which investors and developers operate in mature and emerging markets. Bridging the gap between theory and practice, analysis of local development policies, legislation, valuation methods and taxation is supplemented with case studies from key players in the region’s major cities. 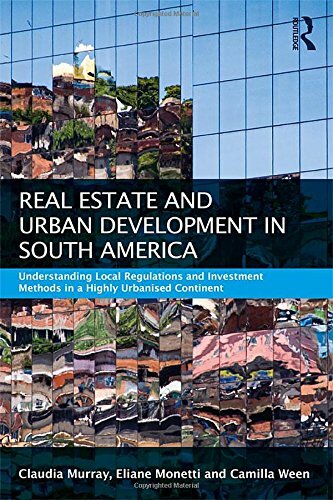 The first full overview of real estate markets in South America, this book will be an essential guide for investors, policy makers, academics and students with an interest in this this rapidly evolving region.